In the past decade or so, space exploration has become increasingly privatized. 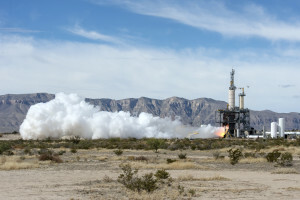 At NASA, the emphasis has been on developing the capabilities of private companies to launch astronauts to the International Space Station and complete resupply missions. As one could imagine, such operations have proven difficult to set up and companies such as Elon Musk’s SpaceX, Jeff Bezos’ Blue Origin and Richard Branson’s Virgin Galactic have just begun to see success. Take for instance, SpaceX’s cargo supply flights which have been launching since 2012, with 6 out of 7 missions completed successfully. These missions deliver crucial supplies to the International Space Station at a cost that is much lower than what NASA could achieve on its own. In fact, NASA has awarded a $1.6 billion contract to SpaceX for at least 12 resupply missions. Blue Origin announced Tuesday that its space vehicle New Shepard had successfully flown up more than 100 kilometers into space and then returned to its launch site in Texas. Observers have indicated that this is a big advance in private space flight because the main cost associated with flying comes from the components of the rocket. If more companies can successfully reuse their rockets, then the cost of space flight should continue to decrease. Technologically, the Blue Origin’s rocket is designed to use a technology called propulsive landing, which reignites the engines to help slow down descent and keep the vehicle upright so that it can land vertically. This allows for quite precise control of the rocket as it comes back to earth and makes a landing possible. Of course, Blue Origin’s competitors are not standing still. SpaceX is similarly trying to build a reusable spacecraft, though it wants to land it on a remote-controlled barge in the ocean, not the original, land-based launchpad as Blue Origin has done. Also, SpaceX’s rockets are much taller and are attempting to launch objects into orbit, meaning they require much more fuel and travel at much higher speeds. With this in mind, SpaceX’s strategy is much more difficult, but will prove more useful for NASA and other space missions. In contrast, New Shepard has been designed to have two main compartments, a pressurized capsule suitable for humans and a rocket booster powered by liquid hydrogen. In the future, Blue Origin intends to use the capsule for space tourism, an industry that has already secured millions of dollars of orders. A Blue Origin flight would allow passengers a few minutes of weightlessness and breathtaking views. A series of parachutes would slow the crew capsule so that it could return humans to the ground safely. Clearly, reusable rockets are the technology of the future for many of the industries that have cropped up because of the privatization of space travel. It is only a matter of time before space flight becomes a mature industry with costs and capabilities that far exceed what is available today.